It was like snow in my garden this morning! White Pyrus petals were drifting, tossed here and there by the breeze, flurried across the garden and coming to rest, eventually, on the lawn. 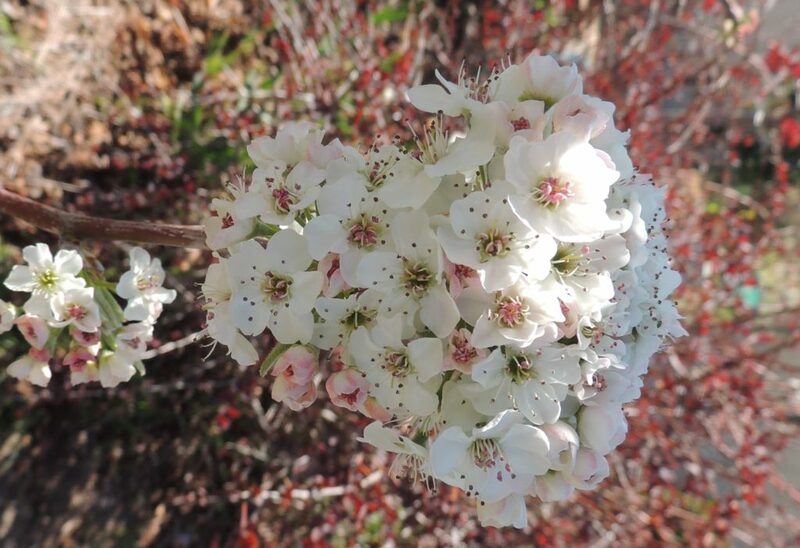 Almost overnight, it seems, Spring has really arrived, and I am in an unusual quandary: that of having many plants to choose for this week's Six on Saturday. Each week gardeners join to present six things from their garden to showcase. The Propagator is the host of this popular meme, so do visit his site to see what gardeners from all over the world are doing. Two: Only recently have I become aware of this plant, thanks to Northern Hemisphere blogging friends-you know who you are. I've never been very fond of orange shades in the garden, but I am in thrall to this Geum 'Totally Tangerine' which I planted recently. I find the colour mesmerising and the shape beauteous. I've planted three, and though there have been whispers of slight thuggishness from some quarters, at this stage I am watching its development with delight and hoping it will fill up empty spaces in the garden. Three: Ranunculus No ID. I planted some bulbs a few years ago and they have spread themselves around the garden in a very satisfying way. I sometimes think they are somewhat looked down upon by gardeners for being a bit too ordinary, but I love them- trouble free and undemanding, they seem to be ignored by snails too. These white ones are delicately tinged by the last rays of the sun and I'm mesmerised by their beauty every time I see them. Four: The aforementioned Pyrus, an inherited tree, one of five. I don't know its name, but its columnar shape seems to suggest calleryna 'Capital' or 'Chanticleer'. 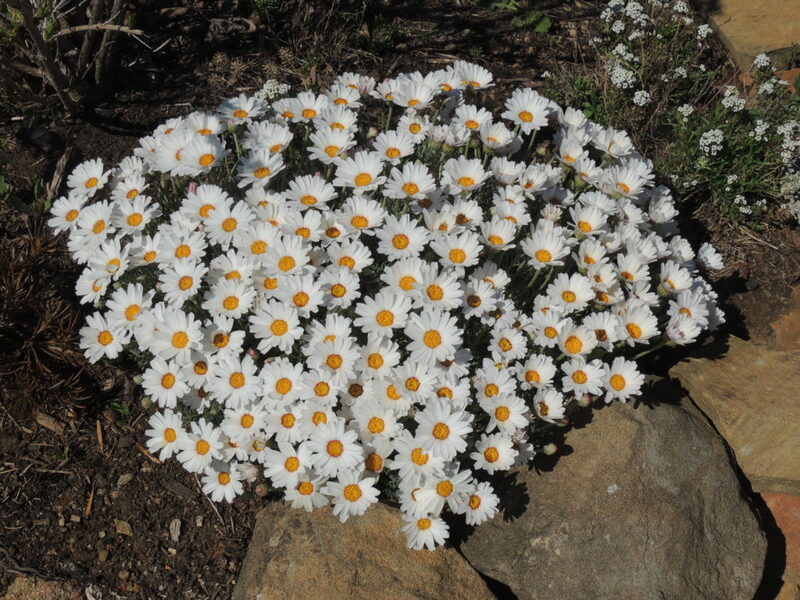 Five: Continuing with a bit of a white theme here, this is Rodanthemum. Is it hosmariense? I'm not sure, but I particularly like the feathery grey foliage and the mass of flowers. It grows very well from cuttings too- always an added bonus. 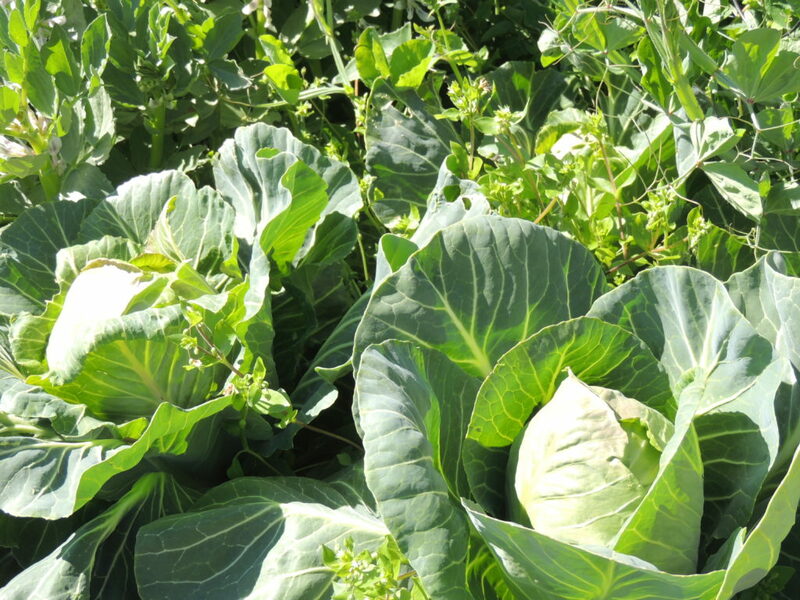 Six: Was it because we had a very cold winter that my cabbages and broccoli were so slow to mature? I don't know, but here they are, ready to be eaten just when we're beginning to think about salads! Not only do they look very healthy, but they've been ignored by white butterflies and are almost free of caterpillar holes. It's of some concern to me that I've seen so few white butterflies: I feel it's a portentous sign of the ills that are besetting our climate and the damage being caused to our insect populations. Sorry to end on a low note. That's my six for this week. Do look at what others are doing in their gardens and happy gardening everyone. Weather today: 10-18C and sunny. Nice to see that you’re enjoying lovely blossom too! We’re having some dismal weather now and I’m missing the nice weather we had before. I really like geums and I love orange – that flower is lovely! The Geum is a revelation to me Liz, and I’m enjoying its presence in the garden. We’ve had some warm days, but cold breezes, typical Spring really. Ah, it all looks so beautiful, Jane! There is a definite sense of spring in your photos, so much billowing white. Quite lovely. I know what you mean about the butterflies, it is a sobering thought (although if I’m honest, I’d love to have seen slightly fewer here this year, the caterpillar damage has been devastating). 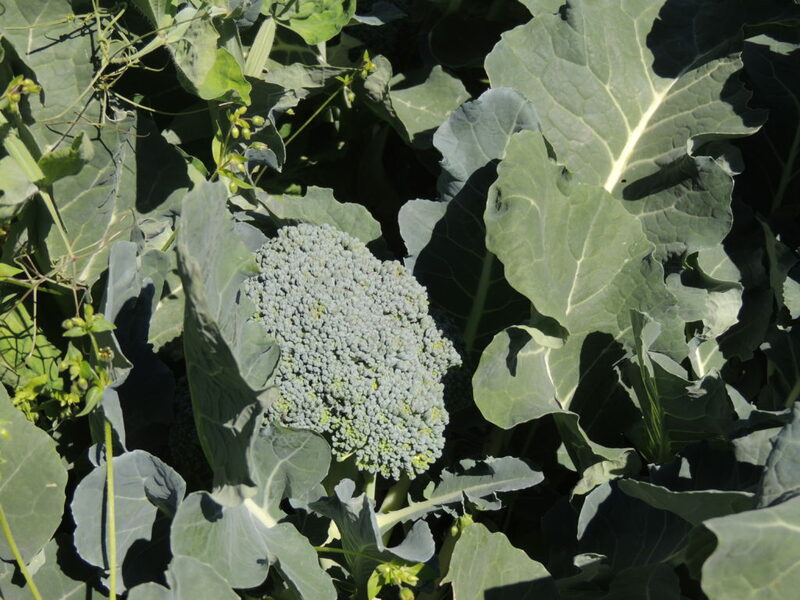 Enjoy those brassicas, they look great! Thanks Lis, it’s such a rewarding time for a gardener. This is the first time I’ve ever grown veggies without having to deal with caterpillars: usually I’ve given up long ago. Agree with you totally about the Geum – what a wonderful, vibrant colour. Spring needs a touch of that kind of in-yer-face orange, otherwise it’s mostly about whites and delicate pinks in the blossoms, don’t you think? Your point about the brassicas and butterflies is well made. Pity not to see plenty of butterflies and other insects in the garden; after all, precious food crops can be protected by close-mesh netting, and there is other food for insects elsewhere in the garden. In yer face orange- I like that, and it is, Sylvia. I’ll be happy if it spreads around a bit. I hope I see more butterflies before too long. Perhaps it was just too cold for them. Fingers crossed. Gorgeous blossoms and so nice to be reminded of spring. Glad you are a convert to Geum ‘Totally Tangerine’ – mine lasted for months this year so make sure to deadhead. Thanks for the heads-up on Geum. Or should that be heads-off? Groan! What a pleasure to see such blooming pictures of the southern hemisphere ..!! Even if the weather is still beautiful here, the temperatures are dropping and the real frost is expected to arrive in a month or two. Every season has its good points I suppose, Fred, but I do find Winter difficult and never look forward to it. I hope the frosts stay away for a good while yet and you get a chance to enjoy a mellow Autumn. Thanks, Derrick. Funny isn’t it. I never quite get used to the different seasons in the two hemispheres. Beautiful blossom! I haven’t seen Ranunculus for ages. I keep telling myself I will restrict the number of different varieties of plants in the garden to make it a little easier to manage (nothing to do with old age, of course!) but then your Ranunculus makes me think again, oh dear! Lovely Six. Do get some-they’re so easy and effective. Snails don’t seem to eat them either. A grave…! Well, yes, I guess it would Tim! It is very pure. Yay, what a showy lot you have there, Jane. Enjoy them while you can. We had 26c yesterday! Cooler now though. That broccoli looks wonderful. How strange about the cabbage moth. Do you think the extended cold overnight temperatures has anything to do with their absence? Hi Tracy, thanks, and yes, I think the cold overnight must have something to do with it. We have had some warm sunny days too: so enjoyable to be outside in the beautiful weather. OMG what gorgeous flowers! The Ranunculus is highly sought after here by florists and others….they make perfect bouquet flowers, often used in weddings. Expensive and not hardy, unfortunately, in my zone. 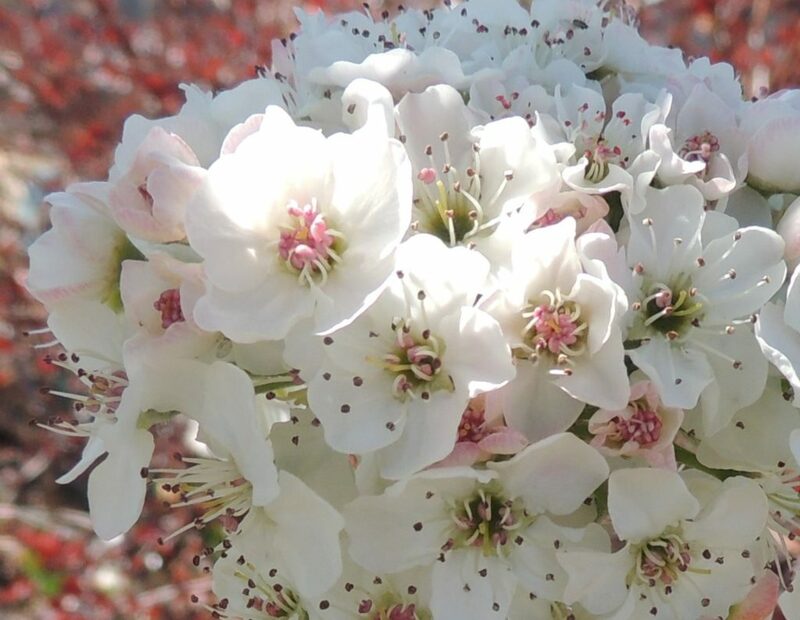 Love the Malus especially!! Thank you Chris. It all seems to burst forth into flower at once, and then we have a long period of very hot and dry weather to contend with. I think wedding flowers for the Ranunculus is a better suggestion than Tim’s of grave flowers! Well there no doubt that you’re enjoying your spring garden! Wonderful descriptive gardening terms Jane – those “fat flowery arms” and “though there have been whispers of slight thuggishness from some quarters” – i detect an unhindered exuberance. I’ve not encountered geums – and that shade of gorgeous Totally Tangerine so i went off to consult Mr Google and discovered such varieties as a ‘scarlet Mrs Bradshaw and a yellow Lady Stratheden” … .. sounds so risque, and imagination goes a bit wild and steamy should those pollinators conjure up a bit hybridisation. Thank you Liz! I’m glad you enjoyed the post. I didn’t know about those other Geums, but they certainly sound interesting. Now where can I get some of those….? Looking good. Nice to see Spring as I start to run out of interesting plants into Autumn. I’ve just been through the ‘finding interesting plants’ thing. Makes a change to have too many for once! Give it a few more weeks and you’ll be seeing six watering cans from my garden as I run out of more exciting plants. Fantastic six! The crab apple surely couldn’t fit anymore blossom and so pleased you have found Totally Tangerine. As we slip into autumn, I will be living more and more vicariously through your beautiful photos. I’m so thrilled with TT Gill, as you can tell, no doubt. Certain bloggers sent me off down that track. You wouldn’t happen to know who they are, would you? I hope the crab apple will actually grow this year and stop looking like an upside-down octopus! Ha! I laughed at your reference to snow – I’ve described the petals of the Pyrus in my front garden the very same way. 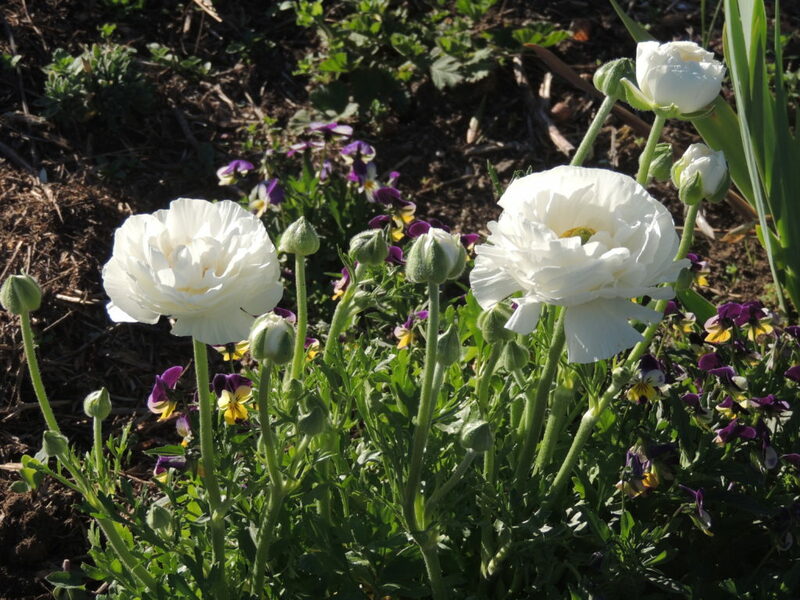 Your Ranunculus is a good reminder that I need to pick up some bulbs for blooms next spring. Have a great weekend, Jane! Thank you, Kris. All is calm today and the rest of the petals are staying on the tree. I didn’t want them to blow away before I enjoyed them. Ranunculus – ordinary? Never. Love the white one. I am very tempted even though I already have hundreds of other bulbs to plant. But maybe, maybe, a little pot. I also love your crab apple with its thick furry arms! I have never seen such smotheration (that might be a made up word). Loveliness all round! Smotheration is a terrific word, Jude! I thought that about Ranunculus because no one ever mentions them. I think they’re almost the best bulbs because they require no effort at all and given your S&S problem, they might be just the thing for you. 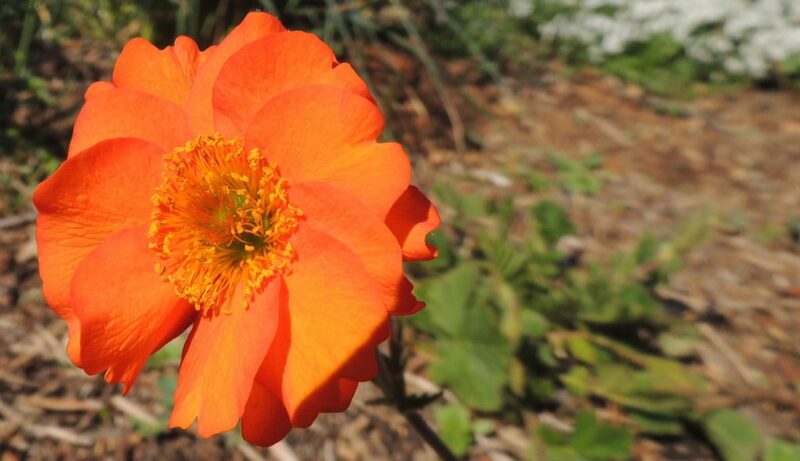 The tangerine colour of your geum is beautiful! My broccoli didn’t do any good this year for some reason, and my cabbages are just coming on now. Lovely garden pics! Thank you Kristah. Lots of coleslaw coming up?? Thanks Jane. It inspires me todo some work in my garden so that I can enjoy it. Hi Cynthia, thanks for your visit. I hope you can get some gardening done-it’s always worth the effort. Gardens are at their best right now, Mind you, when are they ever not at their best? Its pleasure is year around. We are having the annual tulip festival in Bowral which seems to attract thousands from all over the world. I am impressed by your cabbage and broccoli photos. I don’t think we ever managed to grow those vegetables without an invasion of grubs eating them when one takes the eyes off for just a few minutes. My dad spent more on insecticides than on the family, and the garage looked like a pharmacy. We grow most of our herbs and that seems to be hassle-free. 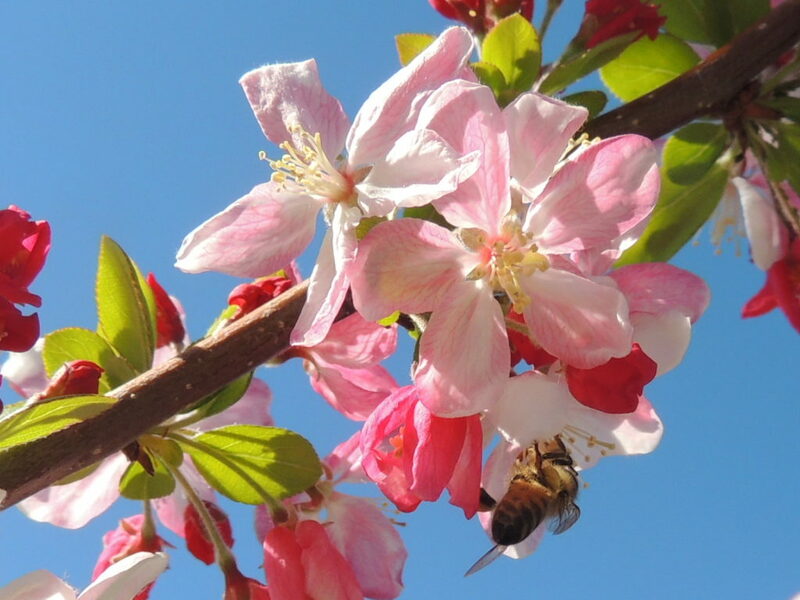 Loved your photos of all those flowering plants and trees, Jane. Thank you for your comment Gerard. Your father wasn’t into organic gardening, then! This is the first time I’ve managed to so successfully grow veggies so I’m feeling a bit chuffed. I went to your tulip festival some years ago and it was well worth the visit, although tulips and I don’t seem to be very good gardening partners! Your garden looks wonderful and the veg spectacular ! Thanks Cathy, Spring is such an exciting time for gardeners. Blossom and blue skies. All looks beautiful. The garden is at its best just now, but soon it will be too much of the blue sky and not enough rain. We have to celebrate while we can. Love the blossom and the white ranuncs. You actually make me want to plant ranuncs and I would always have walked past them normally. I have a predilection for all things white (and almost black), so they’re now on my list! Thank you for showing the garden. How nice to hear from you, Prue, and thanks for your comment. White and black would make a very interesting garden. I recently heard that Gothic gardens, concentrating on almost black flowers are a ‘thing’. I’ll try to rise to the challenge! In Sydney at the moment and hoping to see lots of spring flowers at the Botanical Gardens, but it’s raining constantly. No complaints though- we need the rain here. Spring delights! So nice to see as we head down the autumn road.